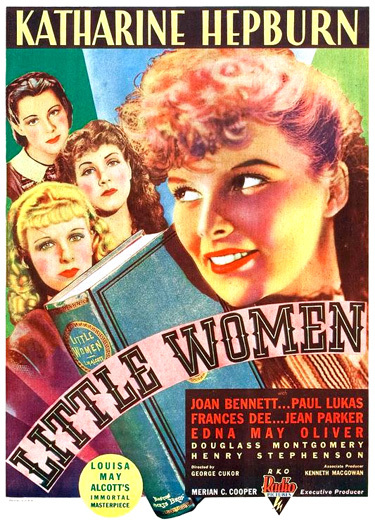 Little Women (1933) is one of the best-made film renditions of the Louisa May Alcott Civil War-era tale of a family of four sisters in New England, from director George Cukor. It was Katharine Hepburn's fourth career film, following her first Best Actress Oscar win for Morning Glory (1933). The March family of Concord, Massachusetts includes self-reliant and sharp-tongued Jo (Katharine Hepburn), Amy (Joan Bennett), Beth (Jean Parker), and Meg (Frances Dee), with their beloved "Marmee" (Spring Byington). There are many wonderful scenes, beginning with the snowy opening title credits. Amy (Joan Bennett) often uses amusing malapropisms: ("I know what I mean, and you needn't be 'statirical about it! It's proper to use good words and improve your 'vocabilary'"), and Jo's enthusiastic favorite expression is: "Christopher Columbus!". One memorable scene is the one in which the March sisters discuss what they'll each do with their Christmas present of $1 dollar from well-to-do Aunt March (Edna May Oliver). Give them all my dear love and a kiss. Tell them I know they will remember all I said to them: that they will be loving children to you, they will do their duty faithfully, fight their bosom enemies bravely and conquer themselves so beautifully that when I come back to them, I may be fonder and prouder than ever of my little women. You've kept away from me ever since I got back from college. And I studied so hard and I graduated with honors, it was all for you....Then won't ya listen? Please. I've loved you ever since I've known you. I couldn't help it. I've tried to show it, but you wouldn't let me. But now I'm going to make you hear it and give me an answer...for I just can't go on so any longer. I know I'm not half good enough for you. But, well, if you love me, you can make me anything you like. Jo tries to dissuade his romantic intentions: "As though I'd change you, Laurie. Laurie, you should marry some lovely, accomplished girl who adores you. Someone who would grace your beautiful house. I shouldn't. I loathe elegant society and you like it. And you hate my scribbling and I can't get on without it. And we should quarrel...oh yes, we always have, you know...And everything would be so horrid if we were ever foolish enough to (marry)..." - she rejects his proposal and then apologizes: "I can't. Oh, Laurie, I'm sorry. So desperately sorry...I don't think I'll ever marry." I'm not afraid anymore! I'm learning that I don't lose you, that you'll be more to me than ever, and NOTHING can part us, though it seems to. Oh, Jo! I think I'll be homesick for you - even in heaven. Beth's last words are spoken to Jo: "I think I can sleep now. Oh look, Jo. My birds. They got back in time" - at the moment of her death when the birds fly off from the window sill, in the very moving, tearjerking scene. We never can be boy and girl again, Laurie. Those happy old times can't come back. We shouldn't expect them to. We're man and woman now, we can't be playmates any longer. But we can be brother and sister, to love and help one another all the rest of our lives, can't we, Laurie? The ending scene brought together the March sisters with their husbands (Meg with John Brooke (John Lodge), and Amy with Laurie) returning home for a long-awaited visit. Jo speaks to the heavens - an aside to Beth: "It's fun, isn't it, Bethie? Now that we're all together again." Would you - Oh, I have no courage to think that, but could I dare hope that I know I shouldn't make so free as to ask. I-I have nothing to give but my heart so full and these empty hands. Jo accepts ("Not empty now") - kisses him as he replies: "Oh, hearts dearest" - and then welcomes him into the door ("Welcome home") to the family reunion.